Shelly Chadha,	The Journal of Laryngology & Otology, Volume 128 Issue 3, pp 221-222. J Addams-Williams, K Wu, J Ray,	The Journal of Laryngology & Otology, Volume 128 Issue 3, pp 223-227. M Boedts,	The Journal of Laryngology & Otology, Volume 128 Issue 3, pp 228-235. Y Fan, R Xu, H Hong, Q Luo, W Xia, M Ding, J Shi, M Lv, H Li,	The Journal of Laryngology & Otology, Volume 128 Issue 3, pp 236-241. B-S Goh, M I M Ismail, S Husain,	The Journal of Laryngology & Otology, Volume 128 Issue 3, pp 242-248. S Henney, R Irving,	The Journal of Laryngology & Otology, Volume 128 Issue 3, pp 249-254. S Kariya, M Okano, T Oto, T Higaki, S Makihara, T Haruna, K Nishizaki,	The Journal of Laryngology & Otology, Volume 128 Issue 3, pp 255-262. H Blanchford, D Hamilton, I Bowe, S Welch, R Kumar, J W Moor, A R Welch, V Paleri,	The Journal of Laryngology & Otology, Volume 128 Issue 3, pp 263-267. 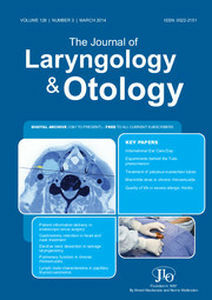 E Dogan, H O Cetinayak, S Sarioglu, T K Erdag, A O Ikiz,	The Journal of Laryngology & Otology, Volume 128 Issue 3, pp 268-273. S Islam, T Al Maqbali, D Howe, J Campbell,	The Journal of Laryngology & Otology, Volume 128 Issue 3, pp 274-278. Should elective neck dissection be routinely performed in patients undergoing salvage total laryngectomy? T F Pezier, I J Nixon, W Scotton, A Joshi, T Guerrero-Urbano, R Oakley, J-P Jeannon, R Simo,	The Journal of Laryngology & Otology, Volume 128 Issue 3, pp 279-283. E Soudry, O Hilly, M Preis, T Hadar, K Segal, G Bachar, R Feinmesser,	The Journal of Laryngology & Otology, Volume 128 Issue 3, pp 284-288. Ulceration of the nasal dorsum: a rare cause? F Salim, A Joshi, C Hopkins,	The Journal of Laryngology & Otology, Volume 128 Issue 3, pp 289-291. R Gohil, J Culshaw, P Jackson, S Singh,	The Journal of Laryngology & Otology, Volume 128 Issue 3, pp 292-295. A Pajaniappane, J Farzan, D M Green, M De,	The Journal of Laryngology & Otology, Volume 128 Issue 3, pp 296-298. T Pézier, B Schuknecht, S Schmid, G Huber,	The Journal of Laryngology & Otology, Volume 128 Issue 3, pp 299-301. M Shakeel, A Trinidade, S Geider, K W Ah-See,	The Journal of Laryngology & Otology, Volume 128 Issue 3, pp 302-306.